In this episode: Janet speaks with pioneering homeschool practitioner and advocate Laura Grace Weldon, author of the best-selling book Free Range Learning: How Homeschooling Changes Everything. Laura’s experiences capture the essence of how children learn best and gain competence, self-confidence, maturity and wisdom. 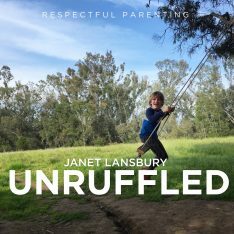 She and Janet find common ground in their respect for the natural learning process of every child. Hi, this is Janet Lansbury. Welcome to Unruffled. Today, I’m thrilled to have a very special guest with me on the phone, Laura Grace Weldon. Laura’s popular book, Free Range Learning: How Homeschooling Changes Everything, is an indispensable guide to natural learning. Laura is an author, an educator, a self-described farm wench. She’s a poet and a perpetual optimist. And for me and, really, one of the reasons I wanted Laura on here besides her pearls of wisdom and her expertise on this topic that I know will be interesting to my listeners, is that I find her a kindred spirit. I’ve only engaged with her online, and still I feel a kinship with her. I feel like we have a lot in common. We have, kind of, a similar sense of humor. There are a lot of downsides to the way that we engage with each other, I think, these days on computers, but for me, this is one of the upsides, that you can actually meet someone, feel like you know someone a little bit just through their writing and the way that you’ve engaged with them online. And we share each other’s work, and I’ve just really enjoyed getting to know her. And this is the first time I’m getting to speak to her as a live person, so I’m very excited about that. A warm welcome to Laura Grace Weldon, author of Free Range Learning, who’s going to talk about home schooling, unschooling, and everything in between. So, welcome Laura. Laura Grace Weldon: Thank you so much, Janet. I think that’s the nicest introduction I’ve ever gotten. It’s really an honor to be able to talk to you, and thank you so much. Laura Grace Weldon: Why, it’s only 300-some pages? Janet Lansbury: Exactly, it’s very comprehensive, but I actually want to be able to ask you questions from a place of being totally uninformed on this topic, which I am. I considered it very, very briefly with my children, 22 years ago when my first daughter, when we were considering her schooling. At that time, it was thought of as a very fringe thing to do, I think. It wasn’t as wide-spread and normal as it is now. And I think that’s a gift to everybody that’s involved in it, that it’s become almost mainstream to make this choice. But I don’t have any experience with it. And I thought that it would be nice to be able to ask you questions without knowing the answer myself because I read your book, which feels a little more authentic to me. And it’s actually … My mentor, Magda Gerber, used to say … One of her bits of advice was: don’t ask a child something you already know the answer to. Laura Grace Weldon: Yeah. Wise advice. Janet Lansbury: Because that’s not authentic, and it makes them feel like you’re quizzing them and putting them on the spot. Anyway, I thought I could ask all the dumb questions, and I would feel more honest. So, the first thing I want to know is, what brought you to this choice? Laura Grace Weldon: You know, I probably was a weird little child to start with, because when I would run out of reading material at home, I would read my mother’s Parenting magazines. And my father, who was a schoolteacher, I would read his John Holt books, which were the thing at the time. It’s kind of weird to read about child development as a child and, you know, to ponder what makes people themselves. I also had a brief stint in my very short career as a social worker, working for Child Protective Services, which I do not have the emotional strength to continue, doing that sort of thing. It also motivated me to see what we can do to prevent problems, instead of working from the opposite end of having problems that need to be fixed. So, I was very interested in the earliest years, and what, how we can help people grow into themselves without causing all sorts of problems. When I had my own kids, it was very important to me to be there along every step of the way, and to be involved in their schooling. And I wasn’t necessarily a big fan on the way public school operates, but home schooling didn’t seem like an option for most people, especially when you have to work. So, I volunteered in the classroom, and I volunteered on committees. And even though I was trying to make a difference, there was not much difference I could make. And I could see school wasn’t really working for my four kids. And it was all for different reasons. My kindergartner could read before he got to school, but he had to work on reinforcing activities day after day on sight words like run and go. And my second-grader was a lively engaged little chap who didn’t really want to do worksheets and screen activities. And so, he would help out other kids and do things. And his teacher was extremely frustrated with him and wanted him on Ritalin. And my fifth-grader was very interested in the sciency things she could do on her own at home, and she was a really avid reader; Was reading high school and even college-level adult books. But the gifted program had been cut back, so she, in her fifth-grade class, had to do the same curriculum everybody else did, including … I think she was reading Mouse On A Motorcycle in fifth grade, which she had read on her own in second grade. My oldest was a freshman. He was really tired of the hours of homework, and there were a group of kids that were hassling a bunch of other kids and he was sticking up for them, which didn’t go too well for him because then they were hassling him. And he would come home and tell me about all these incidences of really severe … assaulting a girl, somebody’s arm got broken. Kind of, all these really severe things. And I would ask the principal and the teachers and they’d say, “Oh, those are rumors. Don’t worry.” One day he called me from school, and one of these bullies had showed him a gun that morning and said, “You’re not gonna live through the day.” So I had no option. I told him to run. Run. Just get out of there. Run home. And I called the school. I asked them to call the police. It was just, it was just a nightmare. They never did call the police. We ended up calling the police, and they told me all the incidents my son had talked about had happened. And so, I went and I met with the superintendent. And in my work life, I worked for and organization that taught non-violence and conflict resolution to non-profits and to school systems. And so, I talked to the superintendent. I offered to do that free for the school system, to get community leaders involved and to change some of these patterns in schools, and he completely denied there was any problem at all, and suggested that maybe my son would feel safer out of the school system. So, we very suddenly and unexpectedly became home schoolers that day. Janet Lansbury: But then, this turned out to be a gift to you and your family, it sounds like. Laura Grace Weldon: It really did turn out to be a blessing, and one of my biggest regrets is that I just didn’t pay attention to all the ways that school didn’t work. Like, the million little nagging mom feelings that you get. And no fault of the teachers; There’s this structure that inhibits so much real learning, that I could just see all these million ways that their curiosity and their enthusiasm and their eagerness was kind of, being squelched. And I wish I had listened to that many years earlier. Laura Grace Weldon: My mother used to say that we live life forward and understand it backwards. Jane Lansbury: Exactly, but I think giving ourselves that grace as parents, too, is very, very important. And I think this whole school choice issue, it is difficult. You know, you obviously want your child to thrive wherever they are. And you see all their talents and their interests, and you want those to be engaged at school, as well as at home or in their own free time. And so, it’s a struggle, I think, for all of us. I think these are the toughest decisions to have to make, as parents, these school choices. So, now that you’ve learned a lot about home schooling, and you are, I would say, hands down, an expert in this, what kind of advice would you give other parents in terms of getting started? Any drawbacks that they should know about? Making it easier? Making it work for your family? Laura Grace Weldon: What’s hardest for me, and I may still be struggling with this, is to get past the school mindset that we’re all encultured with. We spend so many years sitting in those chairs and, you know, pay attention and doing what we’re told. And it takes a long time to unlearn that mindset. And I think that it is really kind of, bled out into the whole culture of parenting, this, kind of, school mindset. And to me, that is the belief that anything that’s real learning flows from instruction. That it’s … Those two are connected. And so, by that logic, the more time that kids spend being instructed, and the more adult-led activities that they’re in, the more that they’re gonna learn. So, parents, especially if they feel like they want to be “good parents,” try to give kids those benefits. And so, there are educational toys and educational electronics and lessons and enrichment programs. And they start really early, and they fill kids free time with that sort of thing. I can understand all of the very best intentions behind that, but what we’re forgetting is, is how much this subtracts from family life, how much stress that adds, and money that costs. And at the other hand, there’s no convincing evidence that any of this has long-term benefit for kids. What we do have is, evidence that this is harmful. So, this is very much like the RIE approach to very young children. We know the more adults instruct and, kind of, interfere and get in the way, the less motivated kids are and the less creative they are in their responses. So, if you show a child how to use a new toy or a new object, the kid’s less likely to use it in innovate and playful and unique ways. And we do this thousands, maybe hundreds of thousands of times each year in a child’s life. Do it this way, do it this way, do it this way. And that’s enculturing them not to think for themselves. It’s enculturing them to think, this is what the authority in your life tells you, so don’t think for yourself. The research also shows that the kids who have the most structure activities in their regular weeks have the most diminished executive function. And that’s the kind of thing that’s built during free playing, and executive function is the biggie. That’s the one that’s most connected to long-term happiness and satisfaction and success in adulthood. And we’re subtracting that by our very best intentions to do all these good things for kids. Laura Grace Weldon: That’s what we have to unlearn. Janet Lansbury: Yes, and it’s true that with the RIE approach, we take this attitude right away that our child knows more about what he or she is ready to learn and how they want to learn it than we do. And not only does that take a lot of stress off our children, and allow them to really take joy in learning and discovering their world, being self-learners, as Magda Gerber encouraged us to perceive them as, but it also takes a load of stress off us as parents. I remember before I learned about the RIE approach, I thought that I had to stimulate my child in this way, at this many months. And now my infant needs this kind of stimulation. I have to do this. And am I getting everything in here? And I wasn’t really doing that because it was all too overwhelming for me, just taking care of her needs and, you know, keeping her content. But the pressure to feel like I’ve got to fill them with all these things. And I’ve got to do the right things at the right time. It feels like a newer mentality in the last 30 years or something, that’s developed somehow, where we feel that if we want our children to learn something, we have to teach it directly to them. Janet Lansbury: We have to teach them to say thank you. We have to get them up on their feet walking. All these things that rob our child of the self-confidence and the love for learning and the joy in our relationship, too, of somebody that’s really affirming to you and is really interested in who you are, rather than trying to make you what they think you should be. All of those things get lost. So it is really, really important. And that’s why I’m … Obviously, my cause is sharing this with parents so that they can get started on the right foot in early childhood and have this foundation for their child’s way of learning and developing. And their child making choices. And so, yeah, I think that’s why a lot of people, they want to continue that approach with school, which to a lot of people, means they want to homeschool or unschool. What is the difference between homeschool and unschooling? Laura Grace Weldon: To me, it’s kind of a spectrum. And I think there’s a problem with both of those words. There’s a lot of problems with those words. One is, that the word home is in home schooling. People just naturally believe that a child is segregated and is away from the real diversity offered by a school. And they’re insulated from friendships and that sort of thing. And what we experienced is that it’s the age-segregated classrooms where you don’t have the freedom of conversation and play where you’re actually more segregated. I was very surprised to find, when we started homeschooling, how much age mixing there is in home schooling and unschooling events. Big kids play with little kids. There’s not the suffocating peer culture. And there’s also this whole world beyond. So my kids, just being able to pursue their quirky little interests, like train-spotting and wildlife rehab, and bagpipe band, made friends and established their mentoring relationships with people who were, some of them were in their seventies. And these were long-term, just really rich relationships that they never could have had if they were in classrooms and then had hours of homework afterwards. The word home is a problem. But even in both of those, the word school is still there. You know, it gives people who are outside of that world the idea that the parent has to be the teacher. As we talked about, you don’t have to really instruct so much, but it takes a great deal less stress and frustration to not wake the kid up in the morning and not go through the rituals of getting out the door. And not dealing with school activities, and not doing all the homework, it’s an immediate reduction in the whole household tension to drop that. And even the people who choose to, kind of, replicate school conditions at home by having a curriculum, even people who do that, which is the opposite end of the spectrum from unschooling, they find that, as any adult would when you’re working with the kid, you can see if the kid has mastered the understanding of math problems and let them do 10 of them instead of three screens or three sheets of 100 each. And that leaves them time, where you can let them free-read books that are interesting to them instead of assigned books and write book reports. And studies have shown that the six hours of school instruction or school day, actually, is about an hour’s worth of actual learning time and instructional time. Laura: So people even who do curriculum … Yeah, really. There’s so much time lining up and discipline. And, you know, explaining instruction on tests, preparing on tests. People who even do curriculum at home tell me they can get a six-hour school day in, in about an hour, hour and a half. And then their kids are, again, free to read, run around, play. That’s the one end of the spectrum is home schooling where you actually have a curriculum. We never afforded a curriculum or wanted one ourselves. At the other end of the spectrum is unschooling where it’s completely self-directed by the child. And they do what they’re ready to and interested to do at the time, and the parent acts as a facilitator. Which, I believe the parent acts as a facilitator any of those times. Janet: And if you don’t have a curriculum at all and you want your child to be able to learn subjects that they’re not organically drawn to, how do you do that? Laura: I think that was one of the things that kept me awake at night, just, like, trembling. Because I couldn’t imagine that I would be able to replicate things like chemistry class and music. And, like, how on earth could I do any of that sort of thing? I just assumed it required experts. And what I gradually came to understand is, that in the whole span of human history, 99.9 percent of that time, school had not been invented. formal instruction hadn’t happened. And we, as a species, evolved beautifully with each generation of kids maturing into capable adults who mastered the skills for their society perfectly well by paying attention to role models, taking on responsibility, playing, learning, growing. And we don’t live in tribes or villages anymore, but one of the things I talk about in Free Range Learning that I gradually stumbled on is called knowledge networks. And those are very simply the people that we know and the people that they know. People with skills and wisdom that they are able to impart to the next generation. And it’s almost, kind of, coded into us ancestrally to do that. So, when you ask people … You know, they may be woodworkers or chemists or farmers or stockbrokers. Whatever they are, can you share a little of what you know with these kids because they’re interest? Or, can you show them what you do? When you use the word share, people are very willing, in my experience, to do that. Maybe not immediately; Maybe next month. If you ask people to teach your kids, that scares them. They freeze up. They get the whole school mindset, and they think they have to have something structured. It’s almost, you’re, like, witnessing a spark. There’s this beautiful current that goes between people when there’s a passion shared. And it’s not hard to ask somebody who does something they love. People do say yes. And right outside of our own knowledge network is our whole community, which is a great deal bigger than the tribe. We’re used to formal things like museums, which have classes, which are awesome. But for somebody like me, I could never afford awesome things that are available to some home schoolers. There are home schoolers that do amazing things. You know, they backpack through Peru and their kids learn great things. And I would love to do that, but we were kind of limited to more free type things. But what we encountered over and over again are these organizations that are right there. And their whole mandate is really to spread what they know. They’re, like, ethnic centers, service organizations, clubs that are based on interests. Any … Name an interest, there’s an organization out there for kids who are into herpetology or astronomy or ham radio, or anything, and most of these organizations, in my experience, are made up of people who are so excited to find kids who want to learn Ukrainian dancing, or pierogi making, or drum making, or anything. And so, this kind of richness was much bigger than anything I could have ever afforded. And it was way bigger than they could have gotten in school. Janet Lansbury: So, did you not feel there were any gaps at all in their education or things that they were missing? Did they go to college? And I would lie awake at night thinking, oh my gosh, this poor kid. I’ve short-circuited his growth horribly. So, he took one or two community college classes to catch up. I think he took trig and something else. Janet Lansbury: Was this as a high schooler or as, in college age? Laura Grace Weldon: He was probably 16 when he took those classes. His first class he’d ever taken was a driver’s test, so he was not too familiar with tests. He did take the SAT to get into college. He scored amazingly well for somebody who had, really, no formal education. And he got a nice scholarship at a nice, private university with a very specialized engineering program. I was still terrified for him. Because, of course, he didn’t have all these AP classes. You know, he had years of hands-on projects and experiments at home, but to me, no academics except for these brief community college classes. You know, a quarter here or there. And as my other kids felt in college, he felt that his classmates were so completely turned off from learning. They just wanted to know what they needed for the grade. They were not that interested in lectures or projects. And Sam was fascinated. He would go up and talk to these professors afterwards, and get involved in things. What he also noticed was, particularly in engineering, if you don’t have a lot of hands-on experience, you can’t conceptualize math and science very easily. So, his classmates were memorizing, studying like crazy, and struggling. And Sam would just listen to lecturers and read the book once. And he was doing his projects with no problem. Helping everybody else out. His physics professor begged him to change his major to physics. He had Sam teaching his physics class. And here’s this little home school kid, lived on a farm. But he had approached it from a whole different angle. Janet Lansbury: He was in the practice of listening and retaining what he heard, because he was interested in it. So, it sounds like a bragging mom, and it probably is, but Sam graduated with the top honors. Laura Grace Weldon: He got an amazing job. His name is on a patent already. He came up with a quick innovation when he was at his company just for a few months, and said, “Whoa, why don’t we just change the manufacturing this way and we’d save a bunch of money instead of retooling.” Which saved them several million dollars. And he’s just turned 25. So, it didn’t hold him back not to have the AP math classes after all. Janet Lansbury: And did you feel like you ever had to be the task master and be setting a lot of limits? Or did it feel like you were actually doing less of that than you would if you had to make sure kids did homework and things like that? Laura Grace Weldon: I think, definitely, it was a great deal less. Because there wasn’t the same kind of homework imposed. But I will admit that I started out home schooling in that emergency situation, thinking, oh my gosh, I’ve got these kids, and I have to do exactly what the school was doing in order to have them succeed. I did notice, particularly with my third child, the one the teacher wanted on Ritalin, that anytime I tried any sort of school approach, he would do basically what the teacher said he would do. He would drop his pencil, he would crawl under the table and look for it, and he’d be down there a long time. Or, we’d be planning to go to the park just as soon as you get this thing done. And he would never get that thing done. But if I stepped back and I didn’t impose that kind of stuff. And I looked at what he was teaching himself, pretty much like, the self-directed education, I would notice that as a little seven and eight-year-old, he was designing his own airplanes and lockets out of balsa, that he was making perfect little diagrams. And as they failed and didn’t work, he would design them better. And he was reading these big research books from the library on the principals of flight, and learning the history of flight documentaries. And just digging deeper and deeper into any subject he was interested in. I think that’s actually surprising to anybody who’s not familiar with home schooling or unschooling, is how rigorous kids can be in the pursuit of their own interests. So, the more I stepped back, the more almost, academically oriented my kids became. It was fascinating. Janet Lansbury: Yeah, I definitely see that in infants and toddlers and preschoolers. And my children at home, actually, too, because I think they had that foundation that, yes, you would see them doing something that was interesting to them. And they were totally involved. And nothing got them down, they could face all the problems and the frustration, and keep going. And have that motivation that, I think, again, like you said, if we try to motivate, it actually does the opposite. If we put ourselves in the position of being the motivator, we will make that a permanent job for ourselves. Laura Grace Weldon: Home schooling is so nice to encourage them to follow their interests. But we, as parents, because we live in this culture, can make that our job. And we can get ourselves so involved and so over-enthused. And overwhelm them with so many resources that it becomes about us. And then, we’ve taken it away from them. Janet Lansbury: Yeah, that’s absolutely right. How often would your children be with other children then? Was that a daily … Well, you had four, so they were with each other. But with peers or maybe, peers that weren’t exactly their age, but other children, other students? How much of their week did they spend? Laura Grace Weldon: It’s the funniest part about the word home, because there’s so much out there to do, particularly now that home schooling and unschooling is a big thing, that you have to almost protect your time to make sure you’re getting to spend some family time. Because all of the facilities around us that are empty during the day because kids are in school open for home schoolers. So they can be skating or going to rock climbing gyms, or swimming pools, or whatever during the day with home schooling and unschooling groups. They can go on field trips. They can be getting together with friends. They can have, you know, movie making clubs, or whatever they’re doing. So, we actually had to protect our time and make sure we stayed home enough so that we felt some peace in ourselves. Janet Lansbury: And did they ever go to things they didn’t want to go to? Laura Grace Weldon: Probably; I did a lot of dragging around to art events. They saw a lot of plays. A lot of concerts. A lot of that kind of stuff. Because I’m interested in it, so … You know, if they could just keep me from singing on the way out or dancing on the way out, it was pretty successful for them. So, you know, we’d pack in some kind of [inaudible 00:30:08] lunch or something afterwards, and things were good. Janet Lansbury: So, you did it, but it wasn’t your day. I mean, I think that’s a drawback that, somebody like me, that as much as I’ve had to learn how to set limits with my children and that you have to insist on certain things. Or you have to insist on “no” to certain things, that that’s not my personality. My personality doesn’t lend myself to that. It’s more enjoying what other people are doing, and the choices they’re making. And so, I would be intimidated by the idea of having to do even more of that than I already have to do, just as a parent. I think that would be a drawback for me in thinking about home schooling. But the way you’re describing it, it’s really … You really didn’t have to do a lot of that. Laura Grace Weldon: Well, I think what I haven’t mentioned is the alliances you make with other parents. There are so many of these wonderful things to do, but it doesn’t require your constant presence. We would just pick up each other’s kids and have a swatch of kids. I ended up with a pretty large van, which is very cliché for home schooling. And, you know, I would drag kids downtown to cool science things and concerts. And everybody else got to stay home. And then, they would drag my kids other places. Janet Lansbury: That sounds like it worked really well. I could ask you a million more questions. I really want to know more, so if possible, could we do a part two? Laura Grace Weldon: I would love to do a part two. Janet Lansbury: That would be great. Well, thank you so much, Laura. And thank you for all the wonderful work that you’re doing, inspiring parents, showing them the possibilities, and the joy, in this different way that is becoming a very valid choice for a lot of people. So thank you for that. And please, everybody, don’t forget to check out Laura’s book, Free Range Learning. It’s at Amazon, and it’s also on your website. Is that LauraGraceWeldon.com? Laura Grace Weldon: It is, yes. And we have a very vibrant Facebook community called Free Range Learning. Janet Lansbury: Wonderful. So you have a discussion community there. That would be something for parents to definitely want to join and ask all their questions. Well, thank you again. It’s great to talk to you. I’m gonna, I want to leave with this image of you singing your way out of the musicals and dancing. We should all go through life like that. Laura Grace Weldon: Aww, the poor kids. Janet Lansbury: Well, they’ll get over it. Yeah, it was interesting for me how that changed. First they didn’t mind when they’re really young. They kind of think it’s funny. Then it’s just total mortification when they’re whatever, like, 10 or 11. And it’s, like, ugh. And anything you do. You can even think about singing, and they see it in your eyes, and they’re mortified. Janet Lansbury: “No, no!” And then they get a little older, and they’re these wonderful adults that you have warm friendships with. And then they kind of think it’s funny again. And they enjoy it, so it’s nice to see how it all changes. And we can be our crazy selves. I’m definitely one to dance in the car. You get certain songs going, and I’m gonna be dancing in the car, and driving with one hand sometimes. Well, you take care, my dear. Laura Grace Weldon: All right, bye bye. 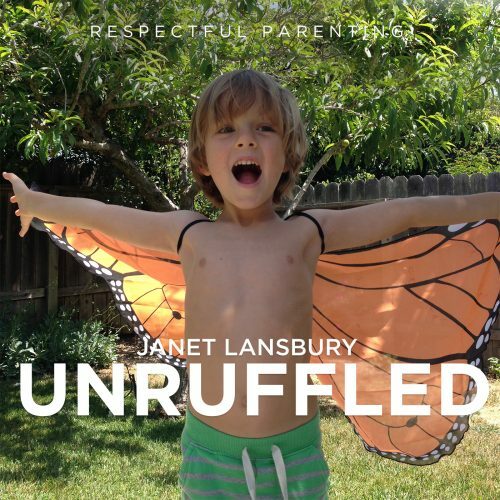 Please check out some of my other podcasts at Janetlansbury.com. And both of my books are available on audio at Audible.com; No Bad Kids, Toddler Discipline Without Shame, and Elevating Child Care: A Guide to Respectful Parenting. You can also get them in paperback at Amazon, and in e-book at Amazon, Barnes and Noble, and Apple.com. Two of my favorite parenting experts in conversation—what a treat! Looking forward to part two. 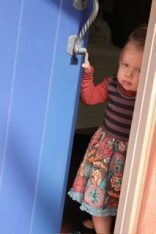 It took me three blog posts to review Laura’s Free Range Learning book—there was that much succulent information for parents. As Janet knows so well, begining at birth, a free range environment allows the child to develop intrinsic motivation—then life is easier and more interesting for all. Yes, kindred spirits! Reading it now, ordered it immediately. I read the transcript (no time to listen), and passed it on to a friend. Thank you for including the transcript! The book is wonderful.